In the depths of America's Great Depression, news of a huge construction project in Washington State brought a flood of unemployed men seeking jobs. The "mushroom towns of the Grand Coulee" sprouted to accommodate them. Workers arrived with nothing but the clothes on their backs and had to construct make shift housing with whatever they could find. Some lived in their cars, caves, or cardboard boxes. The dust of the desert invaded every space. The first paycheck often went to a small tent and a pair of boots. 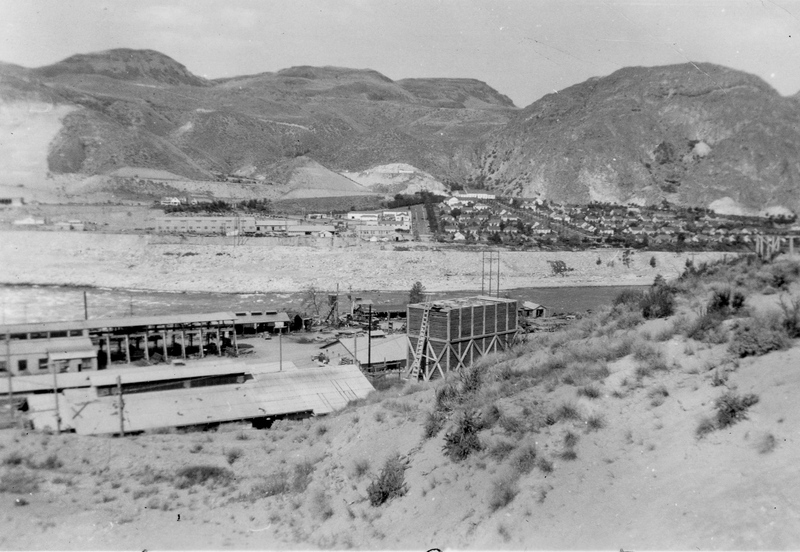 As construction of the Grand Coulee Dam moved forward, contractors and the Bureau of Reclamation took on the additional project of creating living quarters and small towns for their employees. Mason City was built for the supervisors and foremen on the east side of the river, Engineers City for the Bureau of Reclamation on the west side of the river, and the laborers resided above the dam in the town of Grand Coulee. Mason City, constructed by the contractor of the dam, MWAK, was part of the original $29 million construction project. It began with mess halls to feed labors and tourists. The rest of the town was plotted and planned by the company, including schools and recreational facilities. It was to be a "vice-free town" in contrast to Grand Coulee, home of the infamous "B Street." 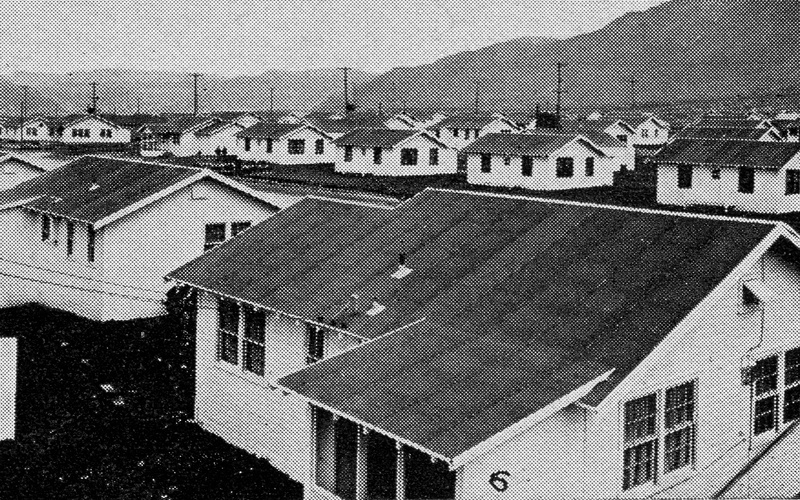 The houses were well designed and the town landscaped and manicured, providing a park with a lawn "large enough for people to rest on," a luxury for the desert area. The buildings were painted a variety of colors to prove that "even a construction town can be made beautiful" and there were recreation facilities for almost every type of sport. 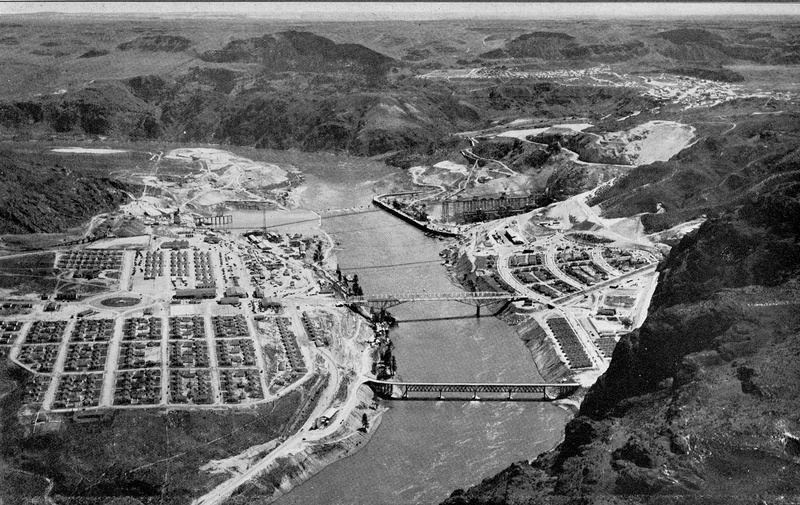 After construction of the dam was complete, the town was going to be auctioned off, but control was transferred to the Municipal Division of the Columbia Basin Project and in 1948 joined with the town of Coulee Dam. In 1957 the government began the process of selling the town to the public, which was completed in 1959. Mason City: The houses built by MWAK for contractors and their families. All of the houses had the same floor plan and were built only to last through the construction period of the dam. Courtesy of The Bureau of Reclamation. 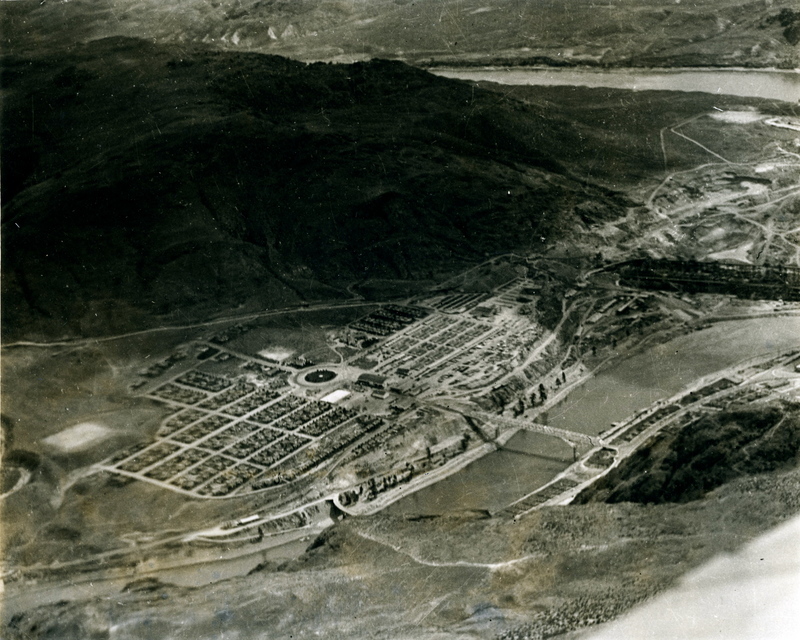 Aerial of Mason City: A view from above, looking at the towns built by the Grand Coulee Dam. Courtesy of the Northwest Room at the Spokane Public Library. Mason City: When looking from above, you can see the careful planning of the governement towns and the effort to create a community, instead of just housing for workers. Courtesy of the Northwest Room at the Spokane Public Library. Mason City: A view of Mason City from the construction site of the dam. 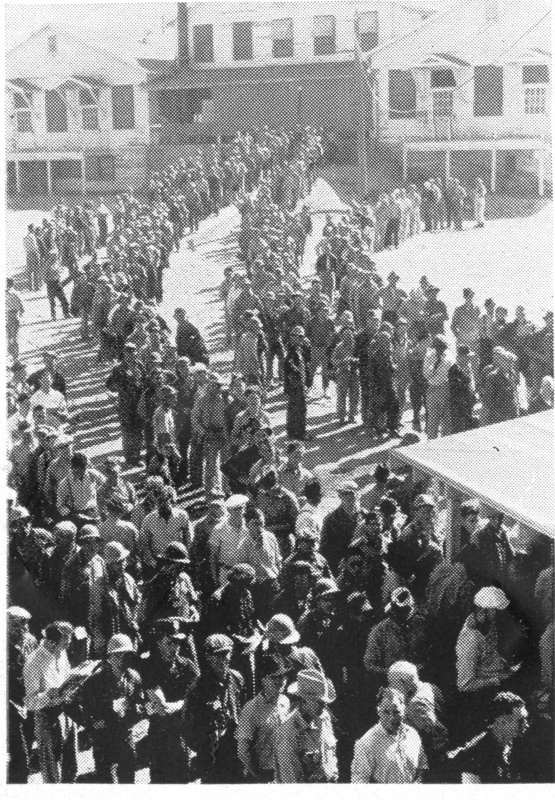 Workers Arrive for Jobs: So many workers arrived to find jobs on the dam that housing and infrastructure was an immediate issue for the construction company. They built boarding houses and mess hall for the single laborers that coule serve the needs of throusands of laborers a day. Courtesy of the Bureau of Reclamation. 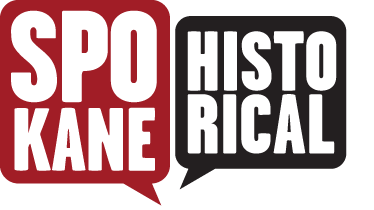 Erin Pulley, “Mason City,” Spokane Historical, accessed April 20, 2019, https://spokanehistorical.org/items/show/376.